The plugin integrates Post Finance payment with J2Store Joomla eCommerce solution. PostFinance's payment solutions offer you secure and fast payment collection. As an online shop operator, you can process all standard payment methods. For Sale, a successful payment will return Status code 9 and for Successful Authorisation, the status code is 5. Both the cases will be treated as Success and Confirmed by thePost finance plugin. The following parameters in your Post finance account (Technical Information) should be set as instructed below. This is your Unique Merchant ID provided by the Post finance. Enter the PSPID associated with your Post Finance's Account. This is the SHA­1 IN signature set up by you in the Post finance settings (see below for the required settings to be done at your Post finance account). This ensure security of your transaction. 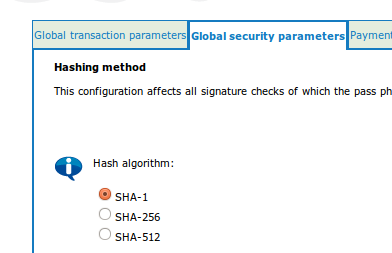 Select Hash method (SHA-1, SHA-256, SHA-512) associated with your postfinance account. It should be set to SHA 1. Payment form page will be displayed in the language chosen here. Create new template and its path to here so that your payment form page will be displayed in the template style chosen here.